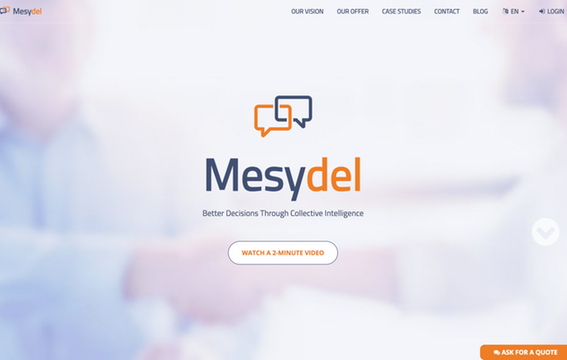 Mesydel is inspired by the Delphi method, an expert methodology used to facilitate a panel consultation and to help making decisions by taking each participant's point of view into account. As a didactic process, the Delphi method was designed to provide the benefits of sharing and exchanging opinions, so that respondents could discover the opinions of others without this excessive influence which is sometimes found in conventional face-to-face situations (which are generally dominated by those who speak the loudest or have the most prestige). The technique allows participants to deal with a complex problem in a systematic way. During each round, the relevant information is shared and enriches the knowledge of the panel members. They are then in a position to make recommendations based on more complete information. Step 2 : first round of questionnaire - each participant gives his opinion anonymously by answering a first questionnaire. Responses are only visible to the moderator and not to the participants, to avoid the self-moderation bias. Step 3 : synthesis of the first round - the moderator gives a feedback to the respondents after having analyzed the first round, then the results of the first round are used to build the second questionnaire. Step 4 : iteration until the desired consensus level - the iterative process allows for progressive co-construction with the panel, such as structured real-time discussion. The process uses as many rounds as necessary to a satisfactory level of consensus or saturation. Step 5 : closing the survey - a final analysis synthesizes what emerges from the varied opinions of a panel on a specific topic. The method is inspired by the Delphi method which was constructed to encourage consensus on specific themes such as prioritization, technological foresight, or decisions on certain technical or medical options. More precisely, the Delphi method creates conditions that are favorable to the convergence of opinions, while at the same time making it possible to discern clearly the points of dissensus. The study of the latter is important, as it legitimizes the method and often leads to redefining the initial problem, again favoring the attainment of consensus. Unlike conventional surveys, the Delphi method consists of an iterative and interactive consultation: a panel of participants is consulted during several rounds, and in each of these rounds, the panel receives a return from the previous round while taking again position with respect to the previous results (controlled feedback process). In addition to giving their opinion, participants are aware of the opinions of the entire panel. They can then provide complementary feedback and refine the results. When to use a Delphi-type survey ? The Mesydel platform is an online application of the Delphi method. The advantages of this online Delphi method are numerous, as it centralizes the logistical and analytical tasks of the method within a single platform. This includes the management of the participant's address database, e-mail communication (invitations, reminders and acknowledgments) and qualitative and quantitative analysis tools.